I consider myself an awkward person. However, I am that rare awkward person who was blessed with a group of highly extroverted, gregarious friends growing up, whose constant slumber parties and note-passing created a beautiful social bubble that kept me in regular contact with humans and also disguised the fact that without them, I was shy and didn’t know how to talk to people. Perhaps it occurred to me to wonder why I was always in trouble for talking too much in classes I shared with my friends, yet turned into a silent mouse in classes with kids I didn’t know well, but at the time it didn’t seem that weird to have two personalities depending on who was around. Now I recognize that there exists a Taryn For Public Consumption, who you’ll find sitting shifty-eyed in the corner and fidgeting with a napkin, and then, like a Russian nesting doll, a bunch of other progressively bigger, louder, (I would argue) funnier, (and if I’m being honest) more emotional Taryns that you might encounter if you get to know me better. Thanks to the friend bubble, I didn’t fully realize how awkward I was until college, when that friend group dispersed and I was on my own to build a new one. Let me tell you, it was a rude awakening. And nowadays when my awkwardness rears its head, it continues to surprise me, because most of my life I’ve perceived myself as a socially normal, if not terribly popular or trendy, person. Then I walk into a crowded wedding reception full of tables for eight with my (one) husband and panic about which six strangers we’re going to have to make small talk with, and I remember. Oh yeah. This is who I am. I was just blissfully unaware of it for 18 years. So reading Ty Tashiro’s book was extremely helpful to me, because it validated a lot of things I’d wondered about myself but didn’t know how to put into words. I’ve known I am an introvert for a while now, but Tashiro points out that that label alone doesn’t fully explain everything about him, and it doesn’t explain everything about my experience, either. It’s not just that I crave time alone, it’s that when I am in a social situation, I don’t know how to comport myself. It’s possible to be introverted and still feel comfortable in social situations, but it’s also possible to be introverted and feel paralyzed by them. One doesn’t necessarily predict the other. That was a big revelation for me, and a comforting one, since I’ve read so many introvert thinkpieces claiming that “being introverted doesn’t mean I’m socially inept!” that left me wondering, “But what if I am?” If introversion didn’t explain my social hiccups, did that mean I was defective? According to Tashiro, nope, I’m just awkward. Somehow, that’s a lot easier to live with. Tashiro also discusses the link between giftedness and awkwardness, and while he’s careful to acknowledge that not all gifted kids are awkward and not all awkward kids are gifted, there’s a higher prevalence of awkwardness among gifted kids than non-gifted kids. Which is a real duh moment if you’ve ever spent any time in a self-contained gifted program. I remember being totally flummoxed one time on a church trip after an interaction with one of the popular girls in my youth group. (Yes, there were popular kids in youth group, welcome to the Bible Belt!) She had loudly criticized the way I was applying sunscreen, which drew the attention of the other kids and of course embarrassed me. I remember thinking, I know I am smarter than this girl. I know the kind of grades she gets in school. So why is it she knows how to get all these other kids on her side? How does she know how to manipulate every situation so she ends up with power and I end up looking dumb? I know I’m smart, so why can’t I figure out how to be more popular? Now I know that while I may have been book smart, that girl far outpaced me in social IQ, and they’re two completely different kinds of intelligence. 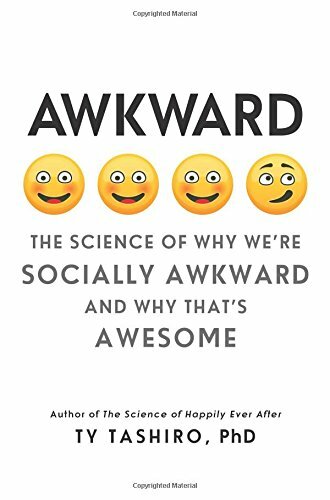 Not everything in the book resonated with me, but that’s to be expected, because there are a lot of ways to be awkward, and thankfully there are some awkward traits I don’t struggle with. For example, Tashiro tells a cute story on himself about a time in grade school when he made edits to his store-bought Valentines because he was uncomfortable with the strong emotions they expressed. Some awkward people are uncomfortable expressing or discussing strong emotions, but as someone who feels compelled to externally process every emotion she experiences (just ask my husband), I don’t have that problem. So I guess I’ve got that going for me. Reflecting on my life this way has made me really thankful for that friend group I had growing up. It makes me want to give each of those girls a hug, and I’m not a hugger. Without them, I strongly suspect I would have spent most of my school years chewing on my hair and staring at the wall. It also fills me with a kind of awe that my husband and I, two incredibly awkward people, managed to meet and date and fall in love with each other. I remember our first date with eternal fondness, but I’m sure to an outside observer it was more like a slow-moving train wreck than violins and birdsong. Fortunately, he’s the kind of guy who finds it endearing that I brought a book with me. I think the best tidbit I took away from Anna Kendrick's book of funny personal essays was not to put too much stock in “nice.” Being nice, as Kendrick explains, usually means being compliant. It means not sticking up for yourself, or knuckling under when people try to push your boundaries. And in order to be a good person, the kind of person you want to be, you might just have to let go of the idea of being nice. Oh man, did I need to hear that. Not earth-shattering advice, maybe, but absolutely freeing for a chronic pleaser who agonizes constantly about other people's opinions. Even people I don't like. Maybe especially people I don't like. I've already been working on setting boundaries and holding to them, even when people try to push me, but having Anna Kendrick's adorable voice in my head sure reinforces those decisions. Nobody controls me but me! Mind-blowing. Adam and I listened to the audio version on a recent car trip, and it was just the kind of light, fun read to break up a long drive. 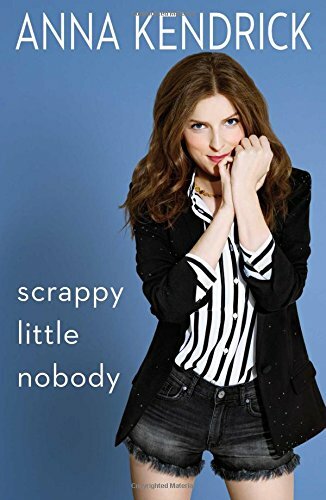 If you're looking for a little whimsy to help you get through the holiday season, Scrappy Little Nobody should be at the top of your list.